Government expected to approve bringing 1,000 non-Jewish family members of Falashmura who immigrated to Israel. The government is expected to approve bringing to Israel some 1,000 relatives of Ethiopian Falashmura. According to the proposal submitted by Prime Minister Binyamin Netanyahu and Finance Minister Moshe Kahlon, in the coming year, non-Jews will be allowed to immigrate to Israel who are family members of those who came by virtue of belonging to the Falashmura community. 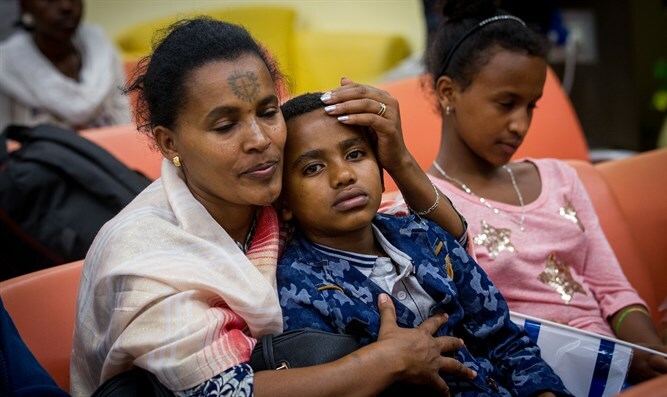 Thus, for example, a Christian woman who married a men from the Falashmura community and immigrated to Israel will be entitled to apply for her parents and single brothers if they reside in the Ethiopian immigrant camps and declare intention to convert. According to the decision, Interior Minister Aryeh Deri and the Population and Immigration Authority will examine the immigration applications and approve them. A senior legal source involved in the matter explained to Arutz Sheva that the draft resolution introduces a standard that is not approved in regard to Jews in other countries. The proposal comes with a heavy cost of NIS 183 million, not including the cost of naturalization. "This is a proposal to bring outright non-Jews who weren't approved in any of the previous waves, even though those waves already blatantly failed with aliyah of people with a weak connection to Judaism, in contrast to the welcome immigration of our Ethiopian Jewish brothers who immigrated earlier," says the legal source. "Now they're taking the last of the Falashmura wives who immigrated to Israel by virtue of the last wide-reaching decision that MK Neguise got in the 61st coalition, and that their parents can also immigrate with their unmarried children. True, they should belong to the community of those seeking immigration in Gondar or Addis Ababa - but these are people who were found ineligible for immigration in any previous expansive round." The source notes that previous government decisions explicitly stated no more groups would be brought for aliyah. In 2016, they confirmed another 1,300 and now add another 1,000 who are relatives of the 2016 immigrants who came to Israel due to their proximity to the 2015 immigrants. "There's no end to this, and now the government's decision explicitly states that more than 1,000 will be sent back to the government for further consideration and approval. "Even worse, this is a precedent that may be applied to immigrants from all over the world. The grandchild clause, and practically - the step-grandchild, is more than expansive enough. But at least today they don't extend the entitlement to parents, siblings, and older children. "Now even this will break. As the Prime Minister's Office director suggests, spouses of Jewish grandchildren from other parts of the world will also ask to bring their relatives on aliyah. This is an endless chain of relatives. It's essential to stop this decision." The Kohelet Forum issued its position on the decision: "Anyone whose Jewishness is proven doesn't need this governments decision, since his entitlement already exists in the Law of Return. "The government's decision to bring the Falashmura to Israel was already an extension that required study. But now they want to bring the Falashmura's non-Jewish family. For example, if a Falashmura married a Christian woman and she and her family joined the Gondar camp, if the couple immigrated to Israel, the woman could demand immigration of her parents and unmarried brothers."